TrueCrypt is probably the best encryption tool to hide the existence of any sensitive data on your computer. It is free, open source and 2 years ago FBI even admitted that they failed to crack TrueCrypt. Using TrueCrypt is not that hard but it may be a bit confusing for some people who aren’t good in computers. First you need to create an encrypted file container which is actually an encrypted file but can be virtually mounted to a drive letter so you can access your private data. During creation of TrueCrypt volume, you will get to choose the encryption algorithm, set the space for the volume and also the password. When the volume has been created, use TrueCrypt to mount the file to a drive letter and then copy the data to the new virtual drive that you want to protect and dismount. Now the encrypted volume file contains your file and it is nearly impossible to crack. Finally you will need to delete and wipe the files from your hard drive so that it cannot be recovered. If you still find it confusing, you can give TruPax a try because it does the same thing but uses a different approach in creating the encrypted container file which may be easier to understand. First you need to make sure that your computer has Java installed because TruPax runs on Java. Then download the correct version of TruPax according to the version of your Windows (32-bit or 64-bit). Extract and run trupax.jar. Optionally you can also click on install_english.vbs or install_deutsch.vbs which will create a shortcut of the trupax.jar on your desktop. The first time you run TruPax you will be prompted to choose the language. Once TruPax is running, all you need to do is either drag and drop the file or folder that you want to encrypt, or you can also use the Add Files or Add Folder button to do the same. Unlike TrueCrypt, TruPax automatically adjust the encrypted container file size to the exact amount of data, so you won’t be creating an unnecessary larger file with empty space on it. However if you prefer to have some free space in the encrypted container, simply set a number at the Free Space box which is in Bytes. An example of extra 10MB free space would be 10485760 Bytes. The Wipe Afterwards checkbox will automatically delete the files from your hard drive after creating the encrypted volume for convenience. I tried using Recuva to scan for the files that are wiped by TruPax but cannot be found. Finally click the Make Volume button, specify the name of the TrueCrypt container file and location that you want to save and click the Save button. Enter the password that you want to use to protect the encrypted container file and click the Proceed button. TruPax uses the default AES encryption. Once the TrueCrypt encrypted container file is created with TruPax, you will still need TrueCrypt to mount the file. 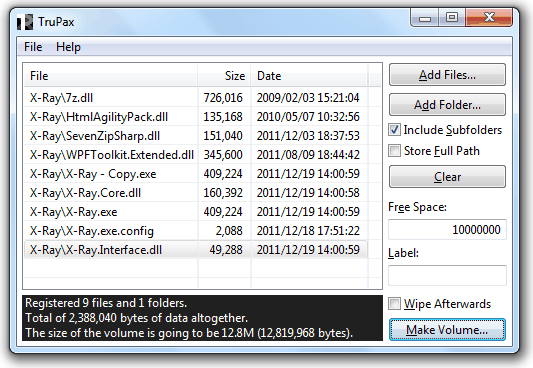 Alternatively, you can also extract the container file from TruePax by clicking the File menu and select Extract. The Invalidate option from the File menu destroys the master key of the container file and will cause its content to become unrecoverable. TruPax is free and runs on Windows XP/Vista/7 and Linux both 32-bit and 64-bit.